Right now, the Jewish world is in a period of time called the Three Weeks of Calamity (or Shalosh Shabbatot d'Puranuta), which is the span of time between the Seventeenth of Tammuz and the Ninth of Av. On the Seventeenth of Tammuz, a number of horrible events happened to the Jewish people, but most notable the walls of Jerusalem were breached in 586 leading up to the Ninth of Av which sees the Temple destroyed. All of the events that fall on these dates are ones that shake up the Jewish people, causing feelings of grief, terror and loss of focus. And watching the news for the past two weeks has given most of the Jewish people around the world those same feelings, especially as we watch world opinion turn on Israel. 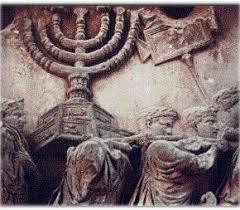 Yesterday was a special Shabbat called Shabbat Hazon, which is the final Shabbat before Tisha B'Av. On that Shabbat we read the first prophecy of the prophet Isaiah ben Amotz. I have read this before in synagogue for the past several years. Since this portion of the prophets is read with two different cantillation systems, I am usually worried about the transitions from one to the next and back. This Shabbat Hazon was completely different. I began just fine, but when I came to the phrase "The cities are burning with fire" I began weeping and sobbing. I had never before lived though a Three Weeks where the emotions of the world I lived in were in line with the emotions in the synagogue ritual. All of my stress, worry and anxiety about what is happening in Israel came gushing out. It was almost impossible to continue, my voice kept breaking. I just hope that the end result of what happened in Isaiah's day does not come to pass in ours. About a month ago, I was in Cincinnati as a chaperone with five members of my youth group on a trip to King's Island. While they were all at local host homes for the night, I was the guest of the synagogue and stayed overnight in their guest room (nicely appointed by IKEA). It's good to simply be there without having to be on for anyone, especially the night before a long day. Another benefit is that I get to be right on time for this congregation's morning minyan, which is quite good. Whenever I have stayed over at this synagogue, I have been at their morning minyan. First of all, this synagogue just finished phase two of a major renovation, and the building is stunning, including the chapel where morning minyan is held. The chapel has beautiful padded wooden seats, contemporary cut glass windows (one for each Jewish holiday) and an ark of wood that covers the entire east wall. The minyan itself is well attended, participatory and has high standards for the quality of the davenning that goes on in there. What caught my eye that particular morning was an elderly gentleman who was leading the morning service. His accent was Yiddish-esque, pronounced both Tav and Sav, and sounded like he learned to daven in the Old World. When it came time to repeat the Amidah, the central Jewish prayer, he began to chant: "...Elohei Avraham, Elohei Yitzchak, Elohei Yaakov..." No surprises yet. This is how every Amidah has begun for about two thousand years with each Patriarch being listed out separately. For two thousand years, the prayer continues on "Ha'el Hagadol Hagibor El Elyon...", but in many modern prayer books, a historical, theological and gender gap has been filled in with a similar list of the Four Matriarchs. He continued, "Elohei Sarah, Elohei Rivka, Elohei Leah, vElohei Rachel." This gentleman, who sounded and look Old World, was davenning the central Jewish prayer with a modern addition! The idea in my mind is that most people his age simply won't do that because it is not how it has been done...ever. I admit, I did not have the chance to ask him about how he came to say this version of the Amidah. It may simply be that this is how the synagogue does it all the time and he does as his rabbi requires. But then he does not have to lead services! So on some level, he accepts the change. Perhaps, he understands the importance of the change. The need to include women's voices both in our past and in our present. True that this is also a large egalitarian synagogue in Cincinnati, which is a center of liberal Jewish thought for over one hundred and fifty years. But he probably came to America in one of the early 20th Century waves of immigration that found Conservative Judaism a good religious fit. Whatever the reason, I have seen that some people of his generation are catching up to mine. And it gives me confidence that innovation is sometimes coupled with reason that transcends generation.